This month marks A TIPical Day's ONE year anniversary, and I am working on giving the blog a make over. It will be little by little, but I am excited for some changes I have planned. 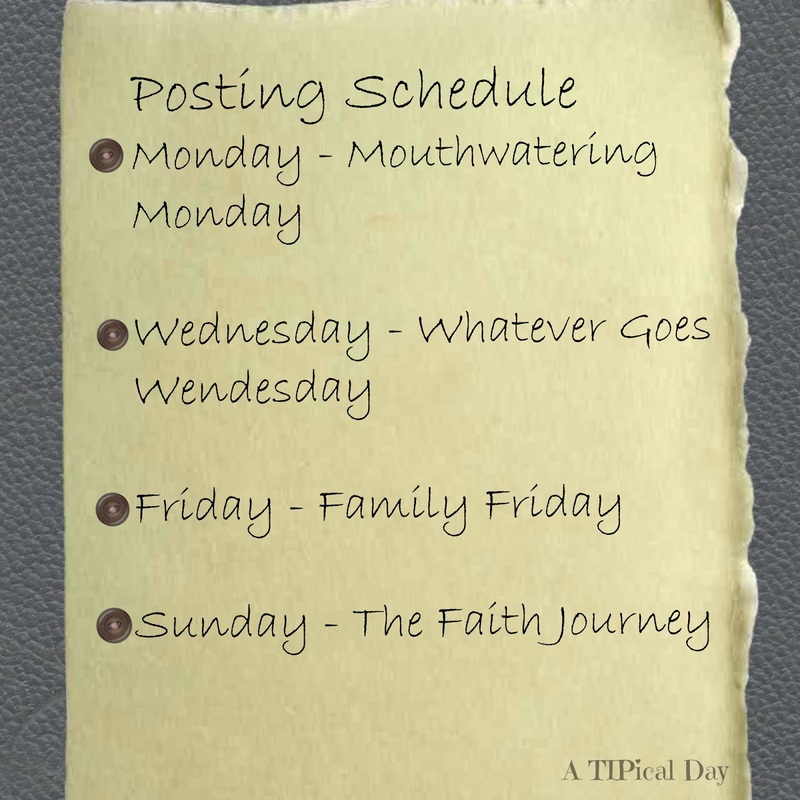 In my first year of blogging, I just wrote whenever I felt the spirit move, which is fine, but I want to be a little more purposeful with my posting, so I am creating a new schedule. I hope that you will find it helpful, and I am sure that I will! So here is a short description of what you can expect to see popping up on the blog. - Mouthwatering Monday's - Every Monday I will be bringing some mouth watering goodies for you. Since my life change to an allergy free diet, I have struggled to find substitutes for all of my favorite foods. I will be sharing some of my favorites, and give you tips on how to prepare health foods your family will love! - Whatever Goes Wednesday's - Since I am a bit of a free spirit, I needed one day that I could post whatever moves me. So if you are looking for something different, come check us out each Wednesday. - Family Friday - Fridays are all about family, parenting, marriage, and homeschooling. - The Faith Journey - The Faith Journey is already a major part of this blog. We will be continuing this every Sunday. This is a weekly look into what the Lord is teaching me. So there you have it. I am prayerful that this will keep me motivated and writing, because in truth, I do love it. Thanks for sticking around!